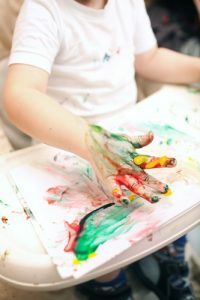 Not all children enjoy art activities, but kids can be friends with art tools and toys, things like crayons, chalk, play dough, paper, scissors, glue and even chocolate pudding. 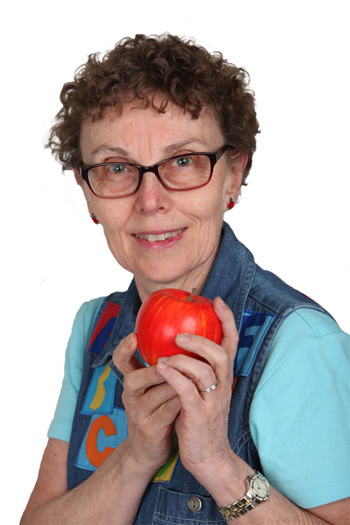 That’s not an art tool, you say? Certainly it isn’t usually, but every now and then, it can be. Not all kids like drawing with crayons and paper, but art is so much more than that. It’s creating with hands-on. Practically anything can be tools and toys. Play dough invites kids to squish, pat, roll, smoosh, squeeze, and sculpt, and then do it again. This is art at play. Play dough is really easy to cut for some practice with scissors. 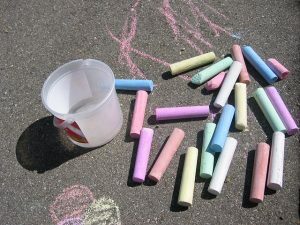 Chalk turns a sidewalk, driveway, fence, patio, or deck into a canvas for expressing the self in lines, colors, pictures, and scribbles. What do you think this child is saying with this long row of balloons? A stick and a beach are also art tools. Washing art work/play off walls isn’t easy, or is it? 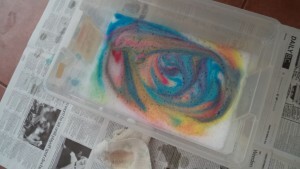 Let kids draw with soap crayons in the bath. Squirt bottles with colored water are a way to turn snow into rainbows. Just fill the bottle with water, food coloring, and send kids dressed for the weather outside to squirt the white stuff. 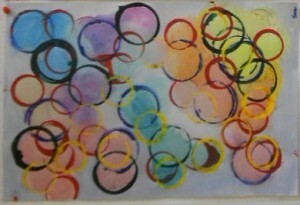 Soap bubbles + color = art fun and play. Now, for the pudding, just in case you didn’t get enough chocolate on Valentine’s Day. (You can also use chocolate crumbs in plain pudding if you have extra chocolate treats. ) Find the biggest plastic plate or even shallow container in the cupboard. Wash hands and together mix up the pudding. Spoon a handful onto the plate or inside the container and let your child fingerpaint. Licks are allowed since hands were washed and kids can draw, paint, and create over and over. Adults forget that kids can create with anything from toys to household objects to nature items. When we remember that it’s much easier so kids can be friends with art tools, toys, and other materials. 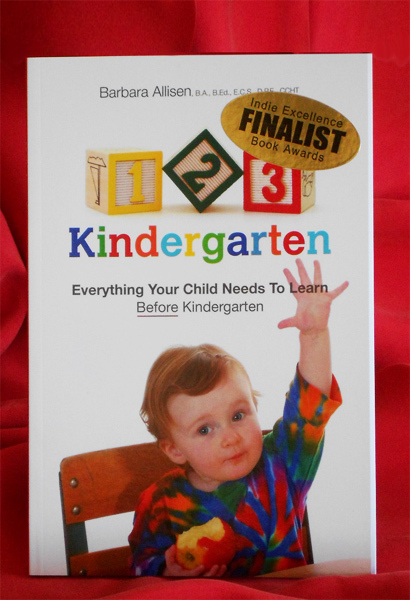 What sort of art play can be part of your child’s day? Olympic art activities for kids aren’t just crafts. Nor are the Olympics just about sports. Did you know at one time, there were Olympic medals for art? From 1912 to 1948, art competitions were part of the Olympics. Medals were awarded in five categories for art inspired by sport. Sports and art do not contradict each other. In a way, the Olympic Games showcase them together. Think of the colors and designs that create a background for the sporting events. Flags, fireworks and displays welcome crowds of people. 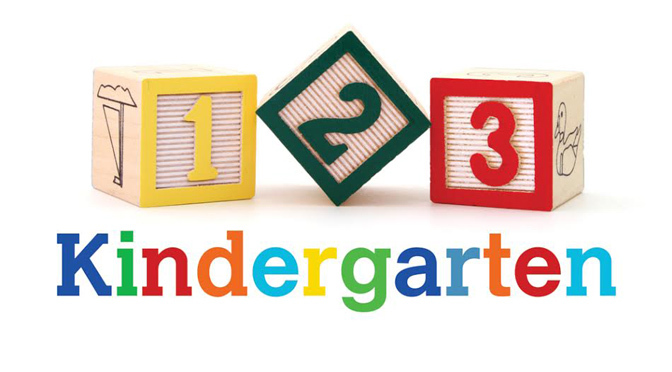 Logos, team uniforms and costumes are crafted by professional artists. 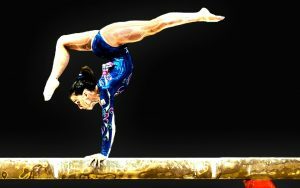 The gymnastics and synchronized swimming would be less visually rich and sensory if all the athletes wore just black. 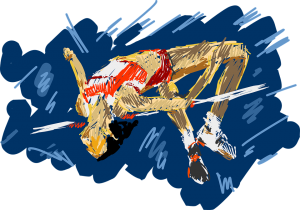 For a change of pace and events, how about some Olympic art activities for kids? Get out some art materials and supplies as an invitation to play. Sidewalks are like arenas for chalk art. Kids can draw in a much larger scale than with paper. 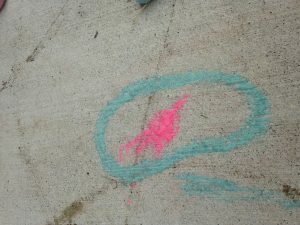 When playing with chalk in driveways, be very careful of cars. 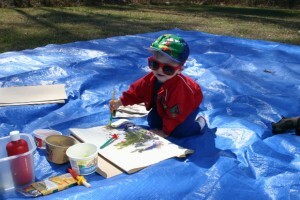 Outside or indoors, kids can paint. Did you see how artistically the walls are painted in Olympic facilities? A backyard fence makes a good wall and the paint can be plain water. Fill a bucket, give kids a wide brush and let them wash paint the fence. Besides paper, kids may enjoy painting on a large box. Several paper towel and tissue rolls dipped into different colors make an entire page of Olympic rings. Crayons and makers are useful for more than walls. Got any old paperplates? They are an unusual alternative to sheets of paper. Art happens in 2-d and 3-d. The recycling basket often holds some great items for re-created art. So do kitchen cupboards. The wheels and the bottle cap on this picture are round like Olympic medals and make great art. Sport and art share many aspects. Both include rhythm and form. One Olympic athlete won a medal in each. 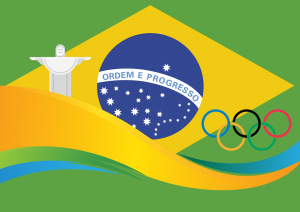 What kind of Olympic art might your child create? Is it really the 47th anniversary of the moon landing? 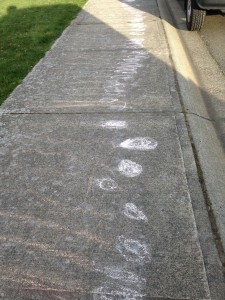 We couldn’t walk on the moon so instead we made chalk moon footprints on the patio. What a fun play-of-the-day and space activity idea. When he walked on the moon, Neil Armstrong said, “One small step for man, one giant leap for mankind.” Because there is no atmosphere and erosion from wind and water, the footprints are still there. Edwin “Buzz” Aldrin took a photo of one of his. 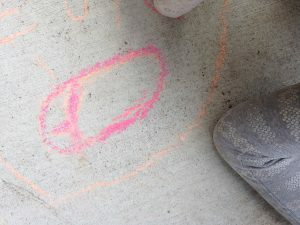 Maybe from hearing about it on the news or listening as we talked around the table, when we went outside to the patio, Little Sister took off her sandal and traced around it with sidewalk chalk. She asked for help with the tracing but colored inside the outline by herself. Unlike the moon, where the water is frozen, she dipped a paint brush from the outside toybox and painted over it with water. Then she scrubbed at it with an old dish brush which is another sort of toy. Soon, her footprint had disappeared. Big Sister made one too. Drawing is another sort of expression for kids. 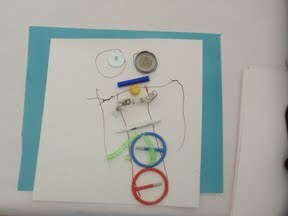 It starts with scribbles and lines as kids discover they have the power to make marks. Later, their marks represent something and we may be able to recognize what it is. Not all drawings though will look like an object. Sometimes kids just draw shapes and colors but whatever they do, it will be meaningful for them. 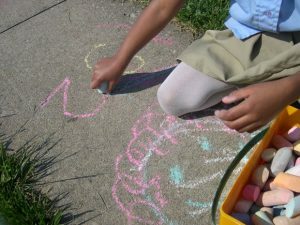 For some fun today, give kids a few sticks of sidewalk chalk and let them draw and color. Sidewalks, patios, decks, and driveways are like giant pieces of paper with lots and lots of space. Even if they are not coloring any planets, asteroids, rockets, stars, or chalk moon footprints, it can still be a space activity. Can they fill up the space? Wonder if the astronauts were tempted to draw in the dirt on the moon?